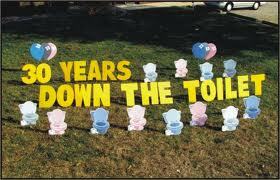 YARD GREETINGS :: DOWN THE TOILET - The Outhouse Party Store Online | Candy, Chocolate, Rentals, Holidays, and More! THIS YARD GREETING COMES COMPLETE WITH THE LETTERS "YEARS DOWN THE TOILET". ALSO INCLUDED ARE 12 TOILETS AND SIX BALLOONS. PERSONALIZE WITH AGE AND NAME AT NO ADDITIONAL CHARGE!! !